I am enjoying the book, Women, Food and God by Geneen Roth. I highly recommend this book for anyone who is sick of dieting and wants to get in touch with the deeper side of change. And speaking of change, I will be facilitating a discussion for the Madeira Chamber of Commerce on Wednesday, Sept. 22. I will share my journey and how Promoting Health: The Middle Way came to be but the main focus will be “Are YOU ready For Change?” The stages of change and what prevents us from taking the next steps. I am attending an all day continuing education seminar on Arthritis this week. I will share highlights of the latest research in next week’s blog. And I am working at my husband’s dental office while his office manager is recovering from back surgery. I also can’t go without mentioning how much fun I am having with my two little granddaughters who turn 2 this month. 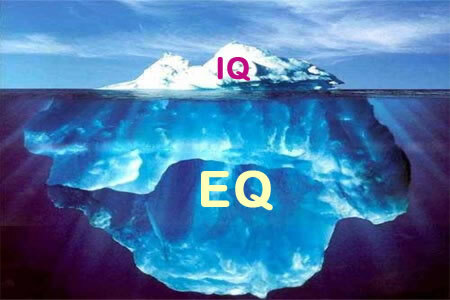 I love the concept of EQ. When Daniel Goleman wrote his book Emotional Intelligence in 1995, his premise that 90% of our success has little do with our IQ made sense and caught on in personal and organizational development circles. What counts is your self awareness, self regulation, and empathy as well as your ability to be motivated and motivate others. Another key component is your ability to communicate and relate in social and business settings. As I am writing this I am watching Oprah interviewing the young Welsh singer Shaheen Jafargholi, who won the approval of Simon Cowell on Britain's talent show. If you watched the segment on You Tube everyone's heart dropped when Simon interrupted him on his first song, giving him a chance to improve on his second song. What happened is everyone in the audience seemed to empathize with this moment of criticism and then within the first verse as Shaheen belted out the Michael Jackson song, his success was written all over the stage. He was cool, confident, and resilient as he simply did what he does best-sing. Oprah asked what he felt in those moments when he was stopped by Simon. Shaheen said he remained calm, telling himself something good would happen and he kept his cool. When he sang for his second chance he just let his voice sing uninhibited in his best tone. His mother said she was scared, anxious, and worried for her son. What was articulated were emotions and feelings. What Shaheen demonstrated was the ability to regulate his feelings for greatest effectiveness. The audience demonstrated empathy, that ability to feel your own heart sink when another person's heart is threatened. The audience was so there for Shaheem at that moment. And Simon stood up and applauded-Simon-the ultimate critic and the ultimate support if he likes you. Self-Awareness, the ability to perceive what you are feeling inside physically, emotionally and spiritually. You can accurately identify anger, frustration, excitement, sadness, joy, irritation or and then you are aware of how you are going to respond in specific situations with other people. You stop, look inside, identify your feelings, and listen to what you are to learn from the situation. Self-Regulation or Self Management-the ability to stay positive and flexible in your response and behavior with other people while staying very aware of your emotions and feelings. Empathy-You are able to pick up on the feelings and emotions of other people and how they are reacting to you and your reactions to them. You are able to put your feet in another's shoes or at least be willing to see that even if you disagree or have different feelings you still have a relationship. Most important is the relationship. Regardless of your feelings and emotions you are able to be with others without attacking, defending, or taking things personally. Instead this emotional awareness promotes clear communication even when there is conflict. Shaheen was very aware that his first song was not his best. In that moment of what we could perceive as failure, he was able to relate to Simon, the audience and his own feelings without falling apart. Instead he was able to effectively move forward and upon Simon's suggestion sing another song. He did so with grace and talent. The entire audience felt the release of momentary tension that turned into a moment of joy.